I’m not much of an endless runner fan. I usually find they stress me out too much and the reward isn’t worth the trouble. But occasionally one comes along that’s just so visually appealing that I need to give it a try. The last one was Alto’s Adventure, which I adored, but eventually got frustrated with and stopped playing. That was in large part due to the way the missions/goals were designed. You have to clear three goals at a time before you’re given any new ones. So if one goal is giving you a hard time, you won’t be able to get any others. That system tries to tell the player what they should be able to handle, when in fact some later goals often ended up being easier for me than earlier ones. 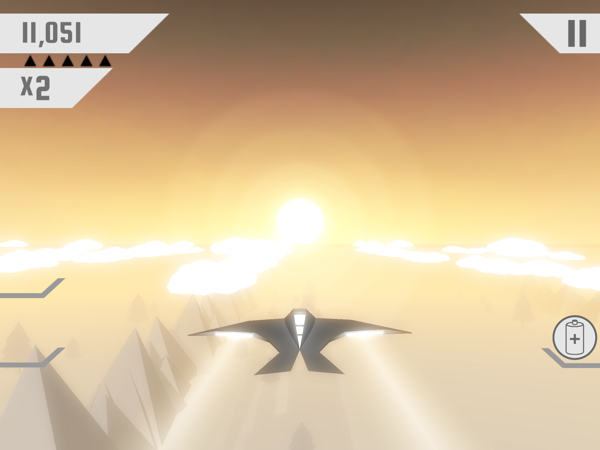 Race the Sun, by Flippfly, also has goals to complete in order to level up and gain abilities. But I find it’s utilized in a much more user-friendly way. There are three tiers of goals — easy, medium and hard. Easy gives you one point towards the next level, medium gives two and hard gives three. When you complete any of the goals, it’s replaced with another one of equal value. This means you always have three different goals to achieve, of varying difficulties. I have yet to see an easy goal that I couldn’t manage, so I’m always making progress, even if it’s somewhat slow. Each level usually requires four points to complete. With the completion of a level comes some sort of bonus like a 2x score multiplier or special ability that can be attached to your ship. 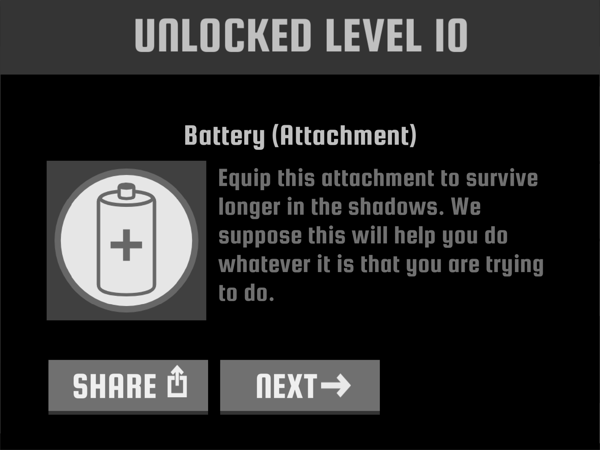 Every new level gives you a bit of an advantage, making it easier to reach a higher score. So you always feel like you’re improving. So what about the actual gameplay? As the name suggests, you are indeed racing against the sun. It starts off high in the sky, slowly lowering until it sets completely. 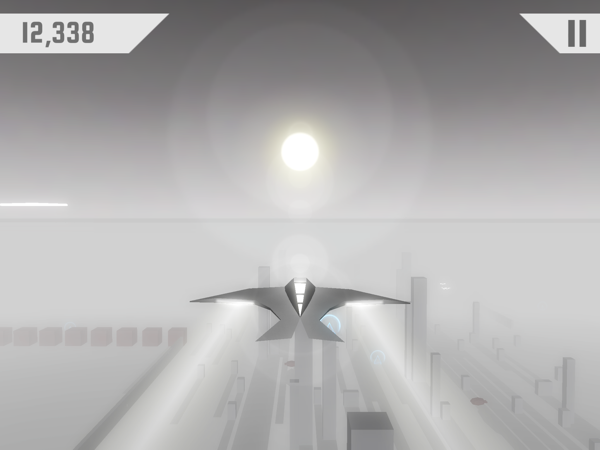 You’re flying a solar-powered jet through all sorts of obstacles. Since your ship is solar-powered, shadows will drain it, as well as the setting sun. Clipping your wing against an object will also drain some of your battery. 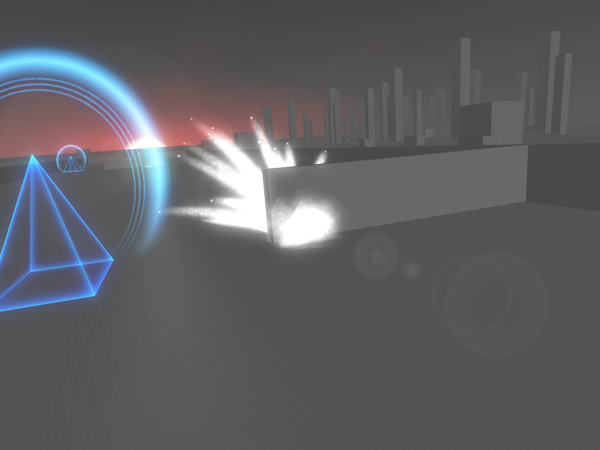 There are some power-ups, though, that you can pick up to extend daylight a bit. But if you run out of power or crash into an object, it’s game over. 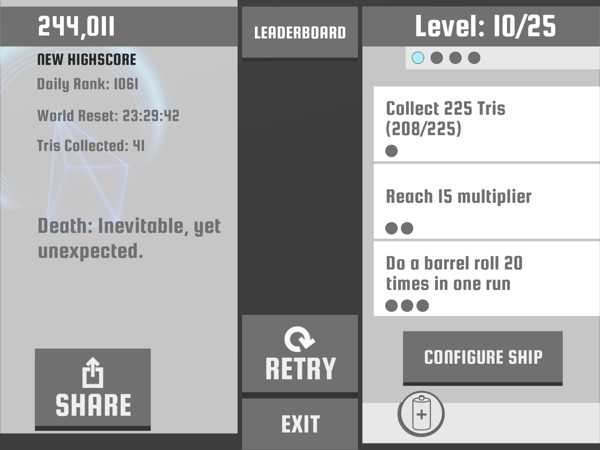 There are also blue triangles to pick up, which multiply your score. The idea is to pick up as many as you can, but also go as far as you can. I’m only able to play Race the Sun on my iPad Air 2 because the game doesn’t support my iPhone 5. This is because it takes advantage of Metal to offer dynamic lighting. So I can only report on how it feels on an iPad. To control your ship, you tap the left side of the screen to move left, and the right side of the screen to move right. The closer to the edges you hold the screen, the sharper the turns. If you pick up a “jump,” a green bar will fill the bottom part of your screen. If you tap that, your ship will jump into the air and glide for little while. For the most part, the controls work very well. The more I play, the better I get at it. But occasionally I do find my hands inching towards the edges of my iPad, past the screen. It’s happened a few times to me, probably because I have smaller hands. I’ve also tapped the jump a few times unintentionally. But that can usually be avoided by holding my hands a bit higher up on the device. I could be wrong, but I think it might be easier to control on an iPhone, at least for my small hands. It also seems like the perfect mobile game, one I’d prefer to take with me instead of playing at home. What I really love about the game and what is most likely to keep me coming back for more is that every 24 hours the environment changes. So if you’re having an easier time one day, you may want to take advantage of it to try and beat your high score. And if you’re having a lot of trouble one day, you can just take a break and see what the next day’s game looks like. For instance, the map just changed about an hour ago and I’ve since beat my high score from a few days ago several times. This gave me a new burst of confidence and sucked me right back in. Will I ever beat my current high score or reach level 25? I don’t know. But there’s enough here to keep me coming back at least every once in a while to try out the daily setup. And I can see playing even more when I get a new iPhone that can handle it. There are also two extra worlds to unlock, which I haven’t done yet. And as a little bonus, the credits are playable, if you just want a relaxing flight through a golden environment. If you like endless runners, there’s a lot to love about Race the Sun. If you don’t like endless runners, I’m not sure this will change your mind. But there’s plenty of fun to be had here if you’re willing to give it a chance. There are also no in-app purchases (IAP) to deal with, a rarity with these types of games. So you know that you’re competing with other players’ skills, not their wallets. If this all sounds good to you, give Race the Sun a try and download it here.